Brillanti Philharmonic & Early Brass, Wind instruments ensemble from Audio Impressions. Audio Impressions "Brillanti Philharmonic & Early Brass" contains 54 Brass instruments recorded in London at Phoenix Studio in 192 kHz and 24-bit depth following the concept of 70 DVZ Strings. Within the brass plug-in, you can allocate notes between players as more notes are added instead of doubling up the same samples. A pattern generator allowing double tongue and other articulations is included in the 54 antique and baroque instruments (Ophicleide, Sackbut, Serpent, and more). All instruments, styles and articulations load at once. You can change sounds by controlling the GUI as you play. You can go from legato through marcato with a single controller. 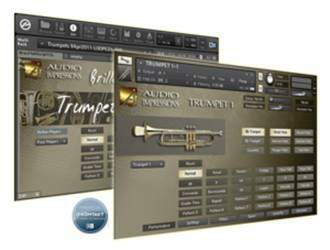 With the SPACE process, there is no complex panning, bussing or routing in your mixer or DAW, and you can place each brass instrument anywhere in the virtual room. Tempo Rubato NLogPoly Synth With the release of NLogPoly Synth for Mac OS X including an Audio Unit version TempoRubato's virtual analogue synth technology - currently known from the iPad app NLogSynth PRO - is now available across both Apple's major platforms: Mac OS X and iOS. de la Mancha Strip T's Special Offer de la Mancha has announced a limited time offer for Strip T’s, a channel strip effect plug-in for Windows.